I have been coveting this mascara for months now! I had to try out Givenchy’s Phenom’Eyes first, which is amazing, and is often compared to the new Hypnose Drama. I purchased it at Sephora. I love this mascara!! It baaad!!!!!! They once again have made a gem. I got super volumunious, fringey lashes. Like wearing thick, fanned-out false lashes!!! Love! It definitely brought the drama. This mascara features an S-shaped brushed dipped in a complex containing saturated waxes and rich, intense, deep black pigments. It also contains Pro-Vitamin B5, which helps condition the lashes. So the formula is designed to coat each lash to instantly thicken them. With a couple of coats! It’s not super lengthening, but I think with the volume and the fanned out effect it creates, you won’t miss it at all!!!! It clumps after about 3 coats but by then, your lashes look pretty dramatic. I did not have any problems with flaking or smudging. It lasts all day and comes off with eye makeup remover. This is a must try and this will be in heavy rotation….along with my Givenchy and Lash Stiletto. Coincidently, I compared this product to the newer Maybelline Lash Stiletto Voluminous. They both have similar S-shaped brushes and both promise volume, but I felt that the L.S. Voluminous fell short. The results that it produced were no different to the original Lash Stiletto (which is supposed to provide length). Did not give me the volume that I expected. I was disappointed especially since I love my original L.S.! The one thing that may bother some people is that you have to take your time with this mascara, no applying it running out the door, no applying it stuck in traffic. Your lashes will love your for it!!!! This is available from Lancome and Sephora. 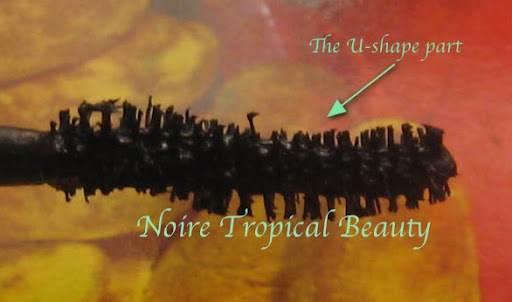 FTC Disclosure: All products mentioned were purchased by me, Noire Tropical Beauty. For more information on my disclosure policy, please check out my disclosure page. The Makeup Show was AMAZING!! !